Near where we live is a grove of trees that are prolific producers of balls that are slightly larger than a tennis ball. 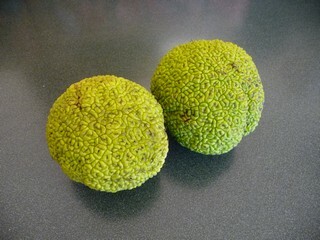 I wondered what they were and found out they are Osage Oranges, named after the Osage Indian tribe. The seeds inside can be eaten but that is all. If you have squirrels, they love them and make a mess ripping them open for the seeds. We don't have any squirrels in New Zealand so these eventually decomposed. I grabbed a couple before they all went and photographed them as seen here. I haven't tried the seeds but may do now that I know they are edible. If you never see another blog article at Light 'N Funny, then you know something went terribly wrong and the advice about eating them is not to be followed.